The New England Patriots bid for a perfect season ended today when the New York Giants defeated them 17 to 14 in Super Bowl XLII. Defense was the key to the Giants victory. Tom Brady was sacked five times, and fumbled once when Justin Tuck hit him. He never had time to work. I guess this is what it looks like when the Patriots don't know in advance what an opposing defense is about to throw at them. They certainly had no spying eyes behind the Giants bench with the extra scrutiny Spygate has brought upon them. On their opening drive, the Giants settled for a field goal, but consumed most of the first quarter's clock. The Patriots then scored a touchdown in a drive that consumed the rest of the first quarter, and some of the second. This was the extent of scoring in the first half. The Giants got a scare when Eli Manning nearly completed a pass to Steve Smith, only to see it bounce off his hands and into those of Ellis Hobbs. That ended the New York's second drive, but New England could not capitalize on the turnover. The Giants Defense kept them in the game. The halftime score was Patriots 7, Giants 3. The third quarter was all defense. Late in the quarter, the Patriots had a chance for a long field goal attempt, but chose to go for it on fourth down. They did not convert. In the fourth quarter, the Giants scored a touchdown, taking a 10 to 7 lead with an Eli Manning pass to David Tyree. This score held up until less than three minutes remained in the game. Tom Brady and his offense finally got on track as the Giants defense began to look tired. Brady hit Randy Moss to take a 14 to 10 lead. Giants fans and Patriots detractors both had to be nervous. It was up to the Giants offense to score a touchdown, and the clock was not their friend. Eli Manning looked like Houdini performing an escape when he just barely got away from a sack, and completed another pass to David Tyree. Tyree leaped and stretched, coming down with the ball in spite of Rodney Harrison's close coverage. Harrison wrestled him all the way to the ground, but he would not drop it. On the following play, Manning was sacked for a loss of one, but was undaunted. Three plays later, he hit Plaxico Burress in the end zone for what would be the winning touchdown. There was time left on the clock and Tom Brady got the ball again, but the Giants defense stopped him one more time. On fourth and long, Brady was not able to complete a pass. The sidelines emptied and the field was mobbed, but there was a small problem. One second was left on the clock. The field needed to be cleared so that Manning could kneel down and end the game. Clearing the field and getting eleven Patriots defenders to come out for the closing play took some time, but was finally done without coach Bill Belichick, who had gone to the locker room already. The 1972 Dolphins perfect season remains unmatched. If the Patriots had pulled it off, it would have been a dark day for all of us who play fair, and try to teach kids to respect the rules of the game. It would have taught kids everywhere that the rules are for suckers, and cheating is the way to get ahead. Instead, the old saying that cheaters never prosper rings true. The New England Patriots ended their season a less than perfect 18-1. 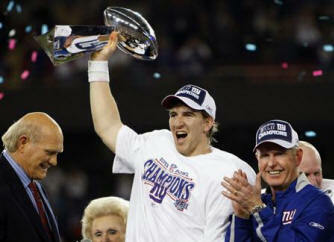 World Champions in Super Bowl XLII, The New York Giants are the cheater defeaters. It was like an old-time western. The good guys always win.